The easy loading nature of these rods makes them sensational. They allow short range, controlled presentation with the absolute minimum of fly line beyond the tip ring. For the light, stream angler working in the tightest situations, Hardy Glass is the perfect choice. Glass fibre has been largely ignored over the past twenty or so years in favour of lighter and faster carbon fibres. 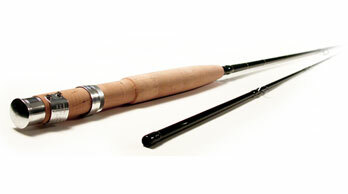 It's true that carbon is a superior material for lots of rod construction purposes, but not all. Adding glass to the mix gives a rod incredible durability and resistance to impact - making it ideal for the toughest fishing on back-country rivers and streams." By mixing glass to carbon we have achieved an easy loading, smooth action, with controlled, well-dampened recovery.